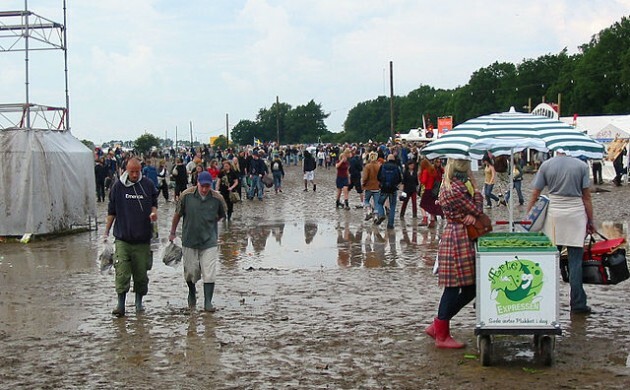 Noon means something different on the Roskilde Festival grounds. Noon is still early, still tired. Last night’s beers are this morning’s sour mouths. The greasy, humid fatigue of waking up hungover in a tent is debilitating – the desire for activities not linked to the procurement of breakfast at an all-time low. Under these circumstances, getting slated for a noon showtime might not always seem an auspicious placement for a performer. Such was the doubt lingering before the scheduled appearance of Julia Jacklin, a rising Australian singer-songwriter and noteworthy purveyor of stylish, lovesick indie folk. At ten minutes to noon a meagre crowd of around 40 mingled at the Pavilion stage, most of them seated. A thin line stood to attention along the stage’s edge, but many seemed to find the venue just a novel place to linger for the length of a cup of coffee. When Jacklin debuted some 15 minutes later, a flare of stage lights revealed an audience that had grown substantially in number and focus. The crowd’s diversity might be an indicator of the wide appeal of Jacklin’s music – faces looking towards the stage were those of hip denim youth as well as collected forty-somethings, longtime listeners alongside nascent fans. Starting from a local music scene in Sydney, the 26-year-old Jacklin found prominence online with her 2016 track ‘Pool Party,’ a soft, glitzy slow dance that blends a dreamy pop sound with aged Americana notes. It was this sound that filled the Pavillion stage for Thursday’s first performance. Jacklin speaks with the timid modesty of a first-time talent show entrant but performs heartbreaking bar-close ballads with driving conviction. Backed by a three-piece band, Jacklin ran through several of her lesser-known numbers to start the show, drawing from her debut album ‘Don’t Let the Kids Win’ as well as sampling her new project with the energetic ‘Cold Caller’. The band then retreated for Jacklin to deliver an impassioned solo rendition of titular track ‘Don’t Let the Kids Win’, a hypnotic number received by the audience with grateful smiles and a steady sway. Her sound is both contemporary and nostalgic – it is an exercise in tasteful melancholia, making one reminisce about a prom one never attended. After a setlist that covered nearly every song of her developing discography, Jacklin drew the show to a close with her breakout hit ‘Pool Party’. A glossy, soft-smiled love ballad, the closing number sealed Jacklin’s performance with tempered, stylish emotion. Stopping at Roskilde Festival on her first worldwide tour, Jacklin’s performance bound a wide audience together in common gratitude for her unique, mesmerising sound, opening the morning with a performance that made evident Jacklin’s practice and promise.